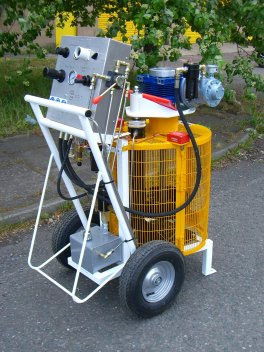 Pneumatic Ram Mounted Heavy Duty Mixer Unit. Components are mixed in supply pails by a 3-paddle mixer blade. The pail is held in position by a hinged clamp piece. Guarding in place with interlock to shutdown system. Control panel mounted at rear of machine for safe easy use. The mixer is raised and lowered by an air powered hydraulic lift pump with control valve for speed and direction.